I have developed an interest in lichen. They’re so neat and small, and so deliberate in their growth – delicious, ancient, self-contained little entities. They please me so much. 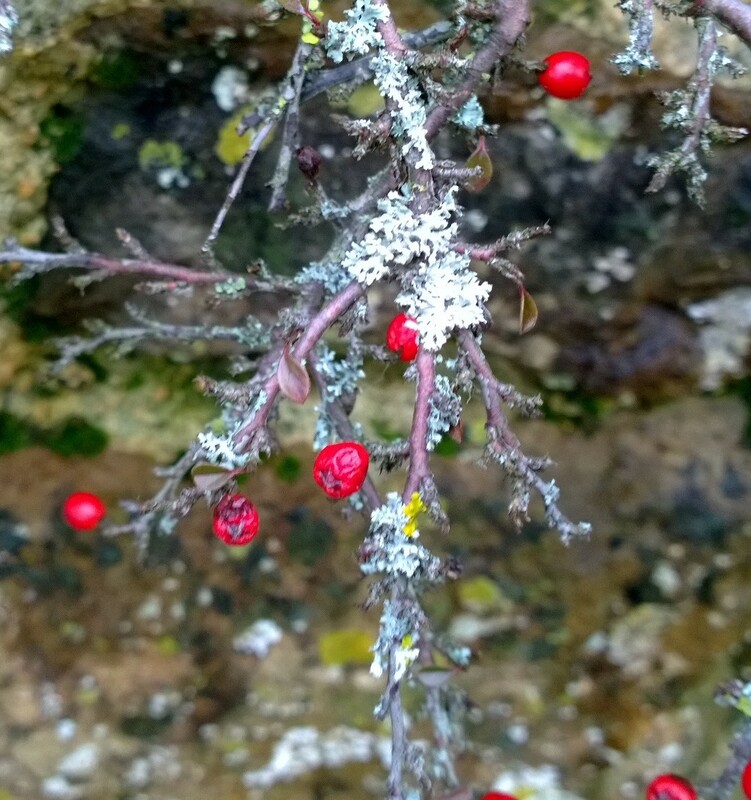 According to Wiki, lichen are a symbiotic relationship of algae and fungus – a mixture of both together. They grow where other plants can’t, and people once sent some lichen into space, opened up its capsule, waved it around for a while, then brought it back to Earth. The lichen hadn’t changed one bit. Such is my interest, that today the beasties and I are walking the same route as yesterday (which normally we loathe doing), just to take a photograph of the incredible lichen we found on the stile leading to Emma’s Meadow. It’s a raw sort of day, and I’m wearing my gloves and hat, my coat zipped up to my nose. Bits of rain keep being spat at us, as if from simmering clouds, and I’m walking quickly to keep warm. As we set out across the cricket field, a whole cloud of wood pigeon suddenly swoop down from the oaks near the road, sending Pants loopy. He so wishes he could fly. I’m too cold to plant daffodils today, so I just launch them into the hedge, and hope for the best. We go quick-march across Dave’s fields – all of the flood water has gone now, and the Sor is back to its amiable, quiet self. 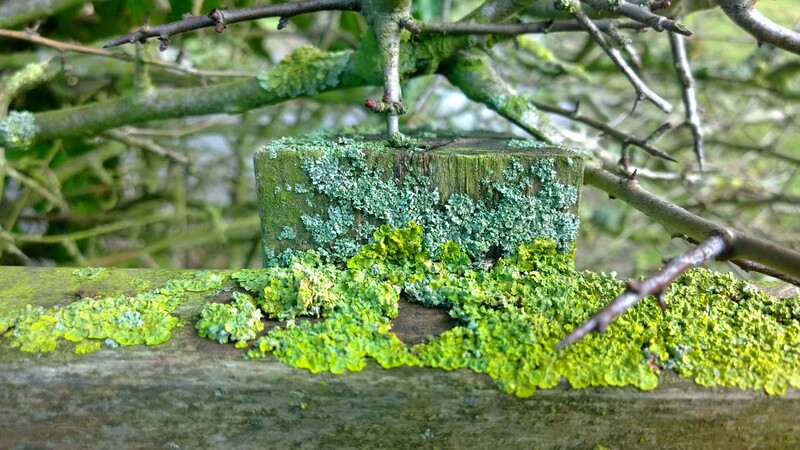 We reach the stile, and I get close up to the lichen I’ve been thinking about. I want to get a marker pen to draw its boundaries, so I can see how much it grows, but I think that might freak out other dog walkers. We set off round the left to circle the meadow, and I’m deep in contemplation of another load of lichen – this time on a branch of something I (frustratingly) can’t identify. It has more orange and warmer yellows than the one on the stile, and I wonder if that’s a product of environment, positioning or type of lichen. I’m just photographing a cow pat with red dots (what? What are these?!) when Pants bristles and backs into my legs. I look up to see Noel opposite, with Lily, his greyhound, and Cissy, his lurcher. Both are a beautiful soft fawn colour – like canine Palominos – and incredibly fast. Pants is terrified of Cissy. I wave to Noel and catch Dora, so she doesn’t become a snackette, and cross the meadow to say hello. About half way across, Pants loses his nerve and legs it, Cissy and Lily in lightening pursuit. He heads for the bottom stile and hurdles it – I’m too helpless with laughter to call him back. He’s such a naughty bully to Dora (who never complains), that I can’t help but think it’s good for him to be taken down a peg or two. Cissy and Lily come back to Noel, but Pants has decided to go home, and has made a break for it to the Lichen Stile. He’s barking now, the way he does when he wants to come in from the garden and we’ve told him to be quiet. I decide to ignore him, and regale Noel with my lichen hunt. He listens politely, but I don’t feel I’ve managed to ignite a shared passion. ‘Must get on,’ says Noel. I wave and go with Dora; Pants is still caterwauling over on the stile. Cissy and Lily have gone off with Noel, and eventually, Pants crosses the stile and heads towards Dora and me. About half way, Cissy appears like a blonde bullet, and poor old Pants jumps in the air and heads for the hedge. Cissy doesn’t go near him, just executes an easy loop, looking at him with scorn. He squishes himself to the ground in supplication and Cissy goes off, laughing. Lichen by the school bus stop. I examine it every day – last year it was a lot more lacy.